The Carlsberg Meridian Telescope has been decommissioned and the Instituto de Astrofisica de Canarias has plans of housing the telescope in its museum. The last night of observing was on 2013/09/01. The final release of the Carlsberg Meridian Catalogue series (CMC15) was published at the end of 2013 (Muiños, J.L., Evans, D.W., The CMC15, the last issue of the series "Carlsberg Meridian Catalogue, La Palma". Astronomische Nachrichten, Vol.335, Issue 4, p.367 (2014)). CMC15 is the last of the series "Carlsberg Meridian Catalogue, La Palma" and comprises all the observations made between March 1999 and March 2011 with the Carlsberg Automatic Meridian Circle in El Roque de los Muchachos Observatory on the island of La Palma (Spain). The catalogues CMC12, CMC13, and CMC14 are superseded by this one. It contains more than 122 million observations of right ascension, declination, and magnitude of stars in the magnitude range 9 < r' < 17 and declination range -40° < dec < +50°. The catalogue internal errors in astrometry are below 30 mas in both coordinates for stars brighter than r'=13, reaching 60 mas for r'=16. The internal magnitude error is below 0.020 mag for stars brighter than r'=13, and about 0.090 mag for r'=16. The data can be obtained from VizieR at CDS (enter CMC15) or the Spanish Virtual Observatory. 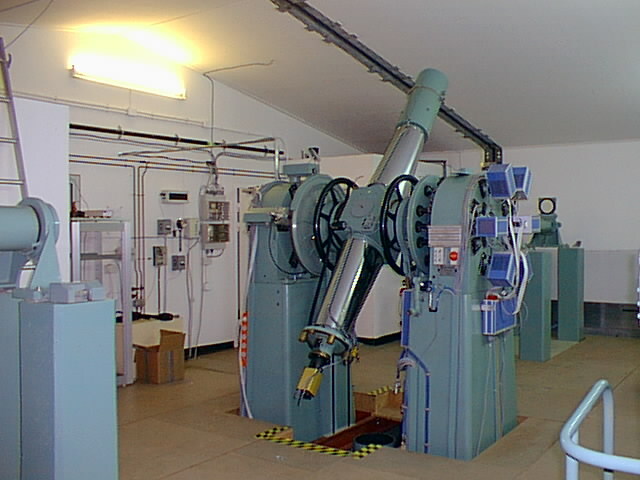 The Carlsberg Meridian Telescope (formerly the Carlsberg Automatic Meridian Circle) was dedicated to carrying out high-precision optical astrometry. Initially it was operated jointly by the Copenhagen University Observatory (CUO), the Institute of Astronomy, Cambridge (IoA) and the Real Instituto y Observatorio de la Armada en San Fernando (ROA). Latterly, it was run solely by the ROA. Although not one of the Isaac Newton Group of telescopes, it was nevertheless part of the Observatorio del Roque de los Muchachos on La Palma. It began operation in May 1984. The telescope is a refractor with an objective of 17.8 cm diameter and focal length of 266 cm. The observing procedure is entirely automatic, with the acquisition controlled by a Pentium PC. The data reduction is carried out in the morning on another Pentium running Linux. When the telescope was first moved to La Palma in 1984 it was one of the first fully automatic telescopes in the world. When the skies were clear a selection of stars (about 500 a night) would be made and at about sunset the dome would open automatically and start observing. An observer would be present on the site (usually in the flat underneath the telescope), but would only be needed if there was a failure of a piece of equipment. Click here for more information on the old system. In the spring of 1997 a further stage of automation was made when we converted the telescope to remote operation. Since then, the telescope has been operated over the Internet from Britain, Denmark or Spain and no observer has been present at the telescope. Most of the problems can be solved over the network, but sometimes local help is needed. By operating in this way a considerable saving is made on travel costs. 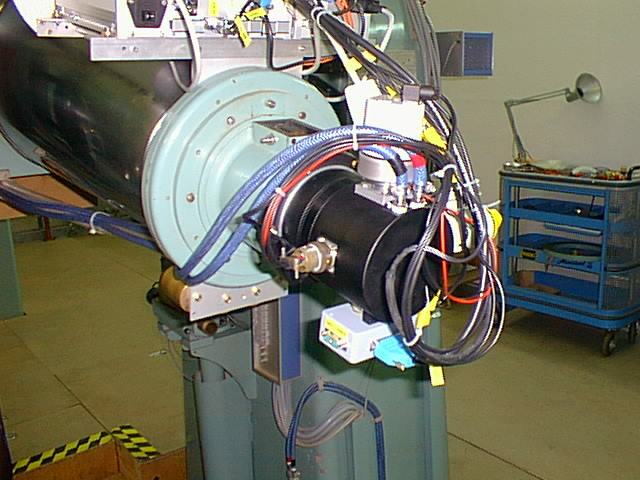 In June 1998 we changed the detector from a photoelectric scanning-slit micrometer to a Charge Coupled Device (CCD) mainly operating in drift-scan mode. This has not only helped us observe fainter stars, but it also has enabled us to observe many stars at once. This one improvement has increased the number of stars we observe a night by a factor of more than 20. The most recent development (April 1999) has been to upgrade the CCD system to a 2k by 2k chip and to fit a SDSS r' filter. These and other improvements with the CCD have allowed us to observe about 4 times as many stars with the new CCD. Our current magnitude limit is r'=17 and we observe between 100,000 and 200,000 stars a night. There is also an RGO leaflet on Meridian Astronomy. 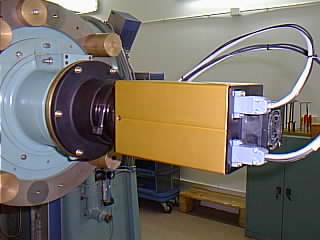 The main task that is currently being done by the telescope is to map the Northern sky using the upgraded CCD detector. This will give accurate positions of stars, allowing a reliable link to be made between the bright stars measured by Hipparcos and the fainter stars seen on photographic plates (as measured by the APM and similar measuring machines). The current area of the survey is between -30° and +50° in declination and has been recently completed. At the IAU General Assembly in Manchester (August 2000) a meeting was held on astrometric surveys. The viewgraphs from the meeting are here. The results of observations with the old micrometer were published annually in catalogues. As well as the positions and magnitudes, the catalogues contain the improved proper motions of many stars derived by combining the Carlsberg position with previous epoch observations retrieved from a data-bank. The average accuracy of the proper motions so derived is 0.003 arcsec/year. Catalogues 10 and 11 were finished in June 1999 and were the last to be published using data from the old micrometer. Carlsberg Meridian Catalogues numbers 1 to 11 can now be interrogated online via the interface at the UK Astronomy Data Centre. Alternatively, the complete data files from the CD-ROM for CMC1-11 can be found here. Carlsberg Meridian Catalogue 14 has been released (31 December 2005). This is an astrometric and photometric catalogue of 95.9 million stars in the red (SDSS r') magnitude range 9 to 17. This catalogue covers the declination range -30° to +50° and supercedes CMC12 which covered -3° to +3° and CMC13 which covered -3° to +30°. Note that this has been superseded by CMC15 (see above). From observations of about 50 photometric standards, the Carlsberg Meridian Telescope provided nightly values of atmospheric extinction in V for La Palma. The data is split up into yearly files going back as far as 1984. The most recent file is that for 2013. From the end of 1999 March this differs from the previous years as it is derived from the new CCD camera which works in the Sloan r' band. For more information look here. Measurements of temperature, pressure, windspeed, wind direction and humidity at the site are taken every 5 minutes day and night. This large database of meteorological records is available to interested persons directly over the web. Details of past projects of the CMT using the old micrometer can be found here. A bibliography featuring Carlsberg observations is available. IAU astrometric divisions, commissions and working groups etc. USNO Circular 179 An explanation of the 1997 and 2000 IAU Resolutions on Astronomical Reference Systems etc. Pictures of the telescope etc. Some more views of the Carlsberg Meridian Telescope.